The Baker Creek Heirloom Seeds catalog first began in 1998 by Jere Gettle. 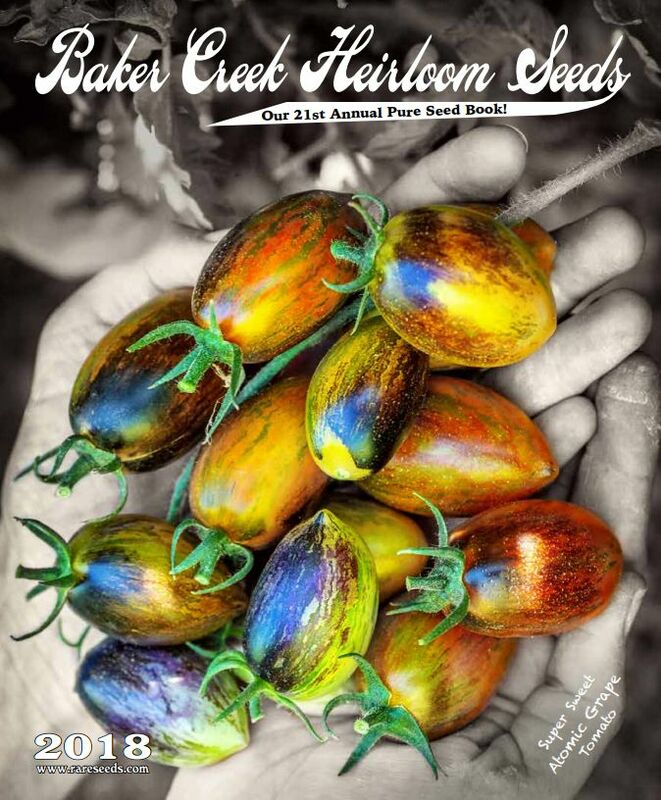 Now, and every year in December, Baker Creek Heirloom Seeds releases a huge (over 200 page!) free seed catalog. This seed catalog reaches hundreds of thousands of people each year and has over 1,800 varieties of heirloom seeds from over 75 countries. Baker Creek Heirloom Seeds sells heirloom seeds for vegetables, flowers, and herbs. You can order yourself a free catalog from Baker Creek Heirloom Seeds by visiting their website's Request Catalog page and filling out that form. On the form, just enter in your first and last name and the full mailing address for where the seed catalog should be sent. There's also a space for your email address but you don't have to worry about filling that out - you can still get the seed catalog even without providing your email. Note: At the very end of the catalog request form are a couple options you can sign up for if you want to get newsletters from Baker Creek Heirloom Seeds, but you can skip over those options if you want - just be sure to uncheck Receive Newsletter if you don't want it. Click the SUBMIT button to send in your information for the catalog. Tip: If you're not from the United States, you can still get a Baker Creek Heirloom Seeds catalog but just not for free. You can do that by opening the Request Catalog page above and choosing the international link at the top of the form. The Baker Creek Heirloom Seeds catalog is only free to those in the United States. International customers can order a Baker Creek Heirloom Seeds catalog but it will cost you. Instructions for international customers can be seen through the link mentioned above. Other free seed catalogs include Burnt Ridge Nursery, Burpee, Brent and Becky's Bulbs, Bountiful Gardens, Botanical Interests, Bluestone Perennials, and Annie's Annuals and Perennials. The Baker Creek Heirloom Seeds catalog can also be viewed online from their website at Rareseeds.com. Though you can still order by mail or fax (see how to here), shopping online is much faster and easier. On the Baker Creek Heirloom Seeds website are various menus that hold different items. These menus include Vegetable Seeds, Herb Seeds, Flower Seeds, Seed Collections, Gardening Books, The Whole Seed Catalog, and Gardening Tools & Gifts. Within these categories are even more subsections to help you shop. For example, the vegetables are narrowed down into menus for finding cucumbers, kale, peas, carrots, squash, cabbage, broccoli, figs, beans, asparagus, radishes, spinach, and several others. Depending on the category you're viewing, you can sort the results by best sellers, newest, alphabetically, packaging type, and price to help you find exactly what you're looking for. If you know the SKU of the products you want to order, you can quickly add them to your online shopping cart through the Quick Order Form page. You can also order the Heirloom Gardener magazine, but that's done through the Heirloom Gardener website.